The first of these books is about architectural visualization (or rendering), a topic I have mentioned before on this site. For a few months now, this book has been available and I was fortunate to have been given a review copy by the publisher. My recommendation comes down to this: When you have “outgrown” my little Kerkythea tutorial linked above, then it’s time to look at this book. It bases all of its tutorials on free software (SketchUp, Kerkythea and Gimp) to create stunning, professional-quality renderings using only those programs. Beyond that, it features tutorials on non-photorealistic rendering, which is a method to create hand-drawn, watercolor-type renderings instead of perfectly-lit ones. It even illustrates the “Dennis Technique”, a hit in the early SketchUp forums several years ago. Rounding off the list of topics are chapters on creating animated walkthroughs and construction documentation using the (non-free) Layout program, that ships with SketchUp Pro. Although SketchUp in the meantime got updated to version 8, rendering workflows mostly have remained the same, so having the old version number in the title should not pose a problem. 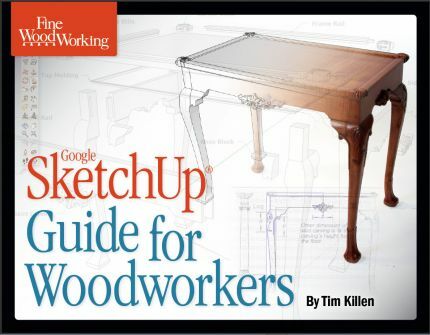 While I haven’t been able to get my hands on a review-copy for this book (yet), I have been following Tim Killen’s excellent woodworking blog for quite some time now. If the book is anything like the postings on his blog, then it will be an invaluable resource for the “digital woodworker”. With the help of his tutorials, you’ll learn how to virtually turn wood, create compound shapes and oblique joinery and assemble everything into a furniture piece like the classic fan-back armchair. If I read the TOC right, he also talks about creating shop drawings using Layout. I have always advocated using SketchUp for workshop prep and detail development and his approach is a great example for this. 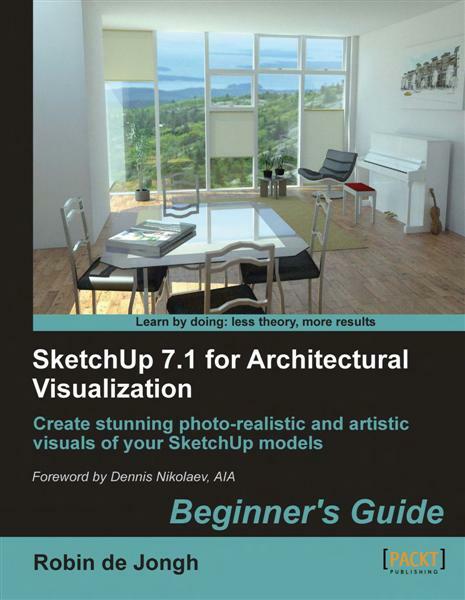 The last book in this roundup may be more for the advanced SketchUp user, but for those it will be an invaluable resource. It deals with programming SketchUp using the built-in Ruby scripting language. If that sounds familiar to you, don’t forget to revisit my recent posts on this topic and install my Ruby editor to try this out for yourself. This book provides a concise, example-laden presentation of what can be done with the Ruby API in terms of creating geometry, automating tasks, creating views and installing scripts in the menu system. It is a great reference for anyone who finds the official API reference a bit too cryptic. While you can download a full PDF copy of this book from the author’s website for free, it is a good idea to also get a print copy for the bookshelf from Amazon.